Keeping your fire alarm system well maintained is the most important thing you can do to keep your employees and customers safe in the event of an emergency. If you already have a fire alarm system installed in your building, you still need regular testing and inspection of the system to ensure that it is ready to operate and alert building occupants of an emergency. Whether you’re looking for inspection services for your retail store, warehouse or office building, State Systems, Inc. can help. Our team is committed to protecting not only your business investments, but also your very life with top-of-the-line fire alarm inspection services. Contact us online or call us at 866-308-5701 to schedule an inspection today! Your control panel inspection includes testing the power source, interface, fuses, primary power supply and transponders. We will ensure that each component is working with the rest of your system. We can inspect and test all of your fire alarm devices, including detectors and sensors. Our inspection equipment has microprocessor-based intelligence and can adjust your system for any environmental changes. 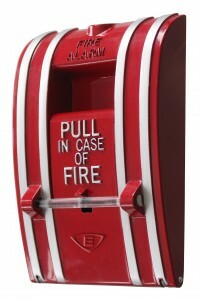 These highly visible (and probably the most easily recognizable) pull stations are a crucial component of your fire alarm system. We check that each system is in working order so that your alarm system can be triggered no matter where in your building an emergency is detected. Proper code compliance is the utmost concern for occupant safety. For all components of your fire alarm system, we will inspect for any damage, obstructions or malfunction that could tamper the operation of your system in the event of an emergency. If you need fire alarm inspection, testing or repair service for your building in the Mid-South, call State Systems, Inc. today or click here to contact us!